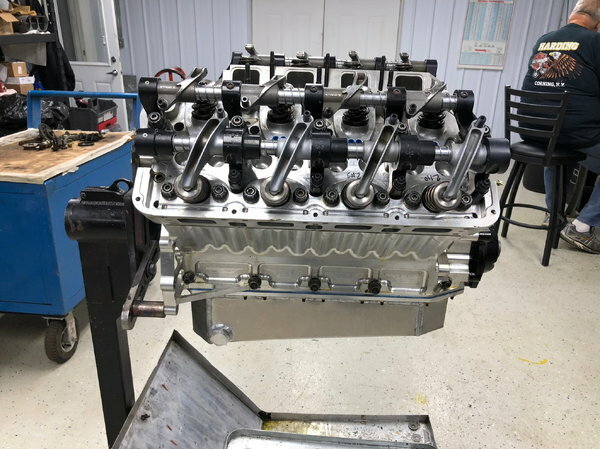 Complete TFX long block assembly. Never hurt or repaired TFX with stage V heads. 4.187 bore 3.65 stroke. Crower billet fuel crank, Venolia Rods, Racetec hard anodized pistons - all new and fresh no runs. Erson cam, Heads are fresh done and set by Total Flow Products. Titanium intakes, inconel exhausts, PAC springs, Titanium retainers, Dechellis Rocker arms, trend pushrods, RCD cam drive, Funnycar dry sump pan. The cost of the parts for this assembly far exceeds the asking price. This motor is perfect for a fuel Altered, nitro Funnycar or top fuel.